Conquer Your Chronic Pain offers the millions of chronic-pain sufferers throughout the world a transformative model for pain management. Dr. Abaci is a pioneer in understanding the biopsychosocial aspect of chronic pain and patients’ demands for a more holistic and personal approach to pain management. 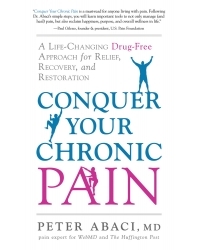 Dr. Abaci details his own struggle with injury, surgery, and conventional recovery and pain management, then offers a wide variety of case studies and clear explanations of the latest scientific research to reveal how chronic pain creates a brain-based disease that will only respond to integrated therapies. For two decades, Dr. Abaci’s approach has helped transform the lives of thousands of people devastated by pain. If you are suffering from chronic pain and are tired of failed treatments and too many pills, relief starts here! Peter Abaci, md, is one of the world’s leading experts on pain. He is the author of Take Charge of Your Chronic Pain, host of Health Revolution Radio, and a regular contributor to WebMD, the Huffington Post, and PainReliefRevolution.com. As the medical director and cofounder of the Bay Area Pain and Wellness Center, his innovative strategies for integrative pain treatment have helped restore the lives of thousands struggling with pain. He resides with his family in Los Gatos, California. For more information, visit peterabaci.com.